Arctic Silver Thermal Adhesive provides new levels of performance and stability. 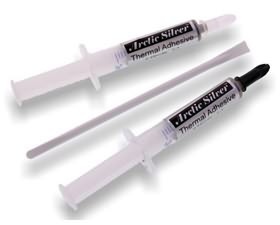 This thermal adhesive is not intended to be used between a CPU and the CPU heatsink, it is designed to provide a permanent bond between chipsets and heatsinks making this silver based 2 part adhesive ideal for mounting RAMsinks to a videocard, as an example. Silver Adhesive Features: Made with 99.8% pure micronized silver. 62% to 65% silver content by weight. Negligible electrical conductivity: Arctic Silver Thermal Adhesive was formulated to conduct heat, not electricity. Arctic Silver Thermal Adhesive is sold in a set of two tubes containing a total of 7 grams of adhesive (3.5 grams of Part A and 3.5 grams of Part B) and a plastic reusable mixing wand. CAUTION! Arctic Silver Thermal Adhesive is a permanent adhesive. Any components you attach together with Arctic Silver Thermal Adhesive will stay attached forever.